February 24, 2014 was an historic day in the movement to gain basic rights for dolphins and whales. A proclamation requesting protection for cetaceans and including a bold statement that dolphins should have the right to their own lives was presented to the Malibu City Council and was signed by Mayor Joan House. The proclamation, initiated by councilmember Dr. Laura Rosenthal, supports the free and safe passage of all whales and dolphins in the city’s coastal waters and “encourages citizens of the world to do all within their power to protect them and preserve the oceans”. 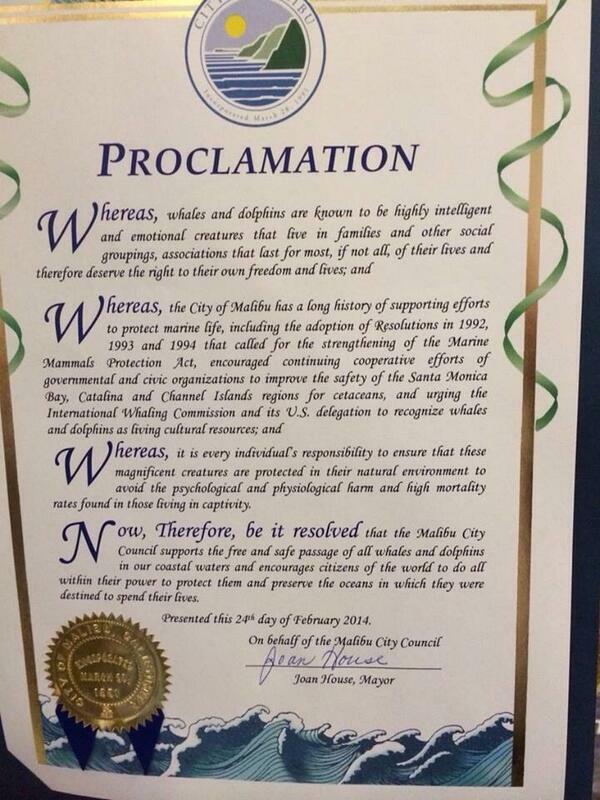 The proclamation included a statement about cetacean rights. “Whereas, whales and dolphins are known to be highly intelligent and emotional creatures… and therefore deserve the right to their own freedom and lives”. This is the first officially recognized governmental statement within the United States indicating that dolphins, or any nonhuman animal for that matter, should be given the right to it’s own life and freedom. Continue reading on Dolphin Project.